The hardy, reliable 2015 Ford Explorer in Grapevine has officially made its grand debut and its offering buyers a few new upscale features they're sure to love. Coming into 2015, the refreshed SUV is packing an all-new Explorer XLT package that adds a stylish flair to the exterior and interior of the vehicle. The use of high-end materials and signature badges give the SUV a premium look that helps balance out its rugged aesthetic. Additionally, three fresh exterior colors have also been included in the color palette to enhance the Explorer's appearance. 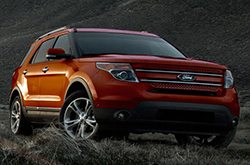 To find out more about these features, read our 2015 Ford Explorer review for exclusive info. Slightly modified this year, the 2015 Ford Explorer in Grapevine gives buyers the chance to outfit their SUV with great new design components that take its styling up a notch. Offered with the Explorer XLT package, these features include an Explorer hood badge, body-color door handles, heated leather-trimmed seats, floor mats with badging and 20-inch aluminum wheels with painted pockets. On top of these excellent additions, the collection also includes a liftgate applique, mirror caps and a grille painted in Magnetic Metallic. When each component is complemented by one of the Explorer's new exterior paint colors, Bronze Fire Metallic Tinted Clearcoat, Magnetic Metallic or Caribou Metallic, the SUV acquires a whole new look that increases its appeal, attracting buyers across the country. 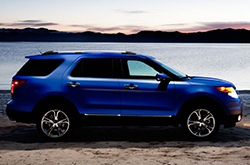 For 2015, the Ford Explorer comes with three unique engines that are offered on select models in the lineup. A 3.5L V-6 engine is standard on all models, aside from the Sport, and comes paired with a six-speed automatic transmission. It delivers 290 horsepower and 255 lb.-ft. of torque, and produces exceptional fuel economy. A turbocharged 2.0 four-cylinder is available on all front-wheel-drive models, comes matched with the same transmission, and outputs 240 horsepower and 270 lb.-ft. of torque. The Explore Sport, however, is the only model to feature a turbocharged 3.5L V-6 engine, producing exceptional power. It exerts 365 horsepower and 350 lb.-ft. of torque, while working alongside the six-speed automatic, creating top-notch performance. We're certain that the Explorer is perfectly designed for you. That's why we supply tools that' enable you to compare Ford's newest model side-by-side with the 2015 Buick Enclave, Chevrolet Traverse, Dodge Durango, Jeep Grand Cherokee and the Mazda CX-9. Just a few of the qualities that shoppers in TX will appreciate are the Explorer's tasteful design and bargain cost. You'll clearly see that when compared to the vehicles listed above it's a remarkable value in regard to price, which is why many Grapevine Ford customers choose it. Find even more details; see our quick-facts list for the Explorer - bullets below this text. Thank you for reading Grapevine Ford's 2015 Explorer review! With the help of seasoned automotive writers, we have published some of the best reviews about Ford's models that you'll find online. To make sensible decisions when it comes to your next Ford purchase, don't guess! Each summary is crammed with data, including info about vehicle features, in an easy-to-understand clear format. 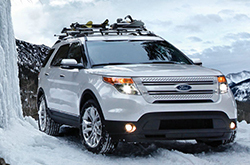 Thank you for reading through Grapevine Ford's 2015 Explorer review. Now that you know more about the Explorer, get in touch with us to learn about finance offers and deals from the OEM that can help you save a substantial amount on your purchase.